Whilst walking on the Isle of Wight on one of our popular walking holiday routes called Source to Sea route I saw my first carpet of wild daffodils in bloom. Really feel as though spring is on its way after the long winter. It has been mainly sunny here over the last couple of weeks and the milder weather has encouraged them to flower earlier than usual. I was walking through a little copse in Billingham and came across them like stumbling upon some hidden treasure. Narcissus pseuonarcissus is the native daffodil delicate and fairly pale in colour and not as blousy as its garden cousins. You will find them in undisturbed shady woodlands and hedgerows. When you are out walking you have time to think, unwind and look around you. 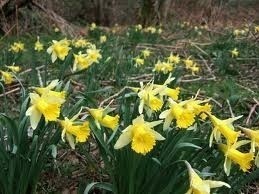 Take enjoyment from the simple pleasures in life have a bracing daffodil hunt this weekend. One of my favourite poems at school was Wordsworth?s daffodil poem found it on youtube read by Jeremy Irons really lovely.